A striking print advert launched by Nescafe. 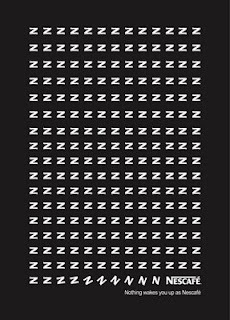 The advert uses Z's to suggest sleep, these then straghten to form an N and spell nescafe. Thus emphasising the human need for coffee first thing in the morning, and that nothing will wake you up better then Nescafe. Simple and clear, the advert reads 'Nothing wakes you up as Nescafe'. Think ive seen this before, clever use of the n/z to be used for two functions. Becuase of the simplicity of it all nothing else is needed a cheap design to reproduce in two colour. Cool...very simple...very catching...one letter is all it takes to get the whole message across...genius!